I like to save money whenever I can, and I also like to use products with natural ingredients (and no yucky stuff that I can’t pronounce! ), so saving money by making my own all-natural bath and beauty products is a no brainer. 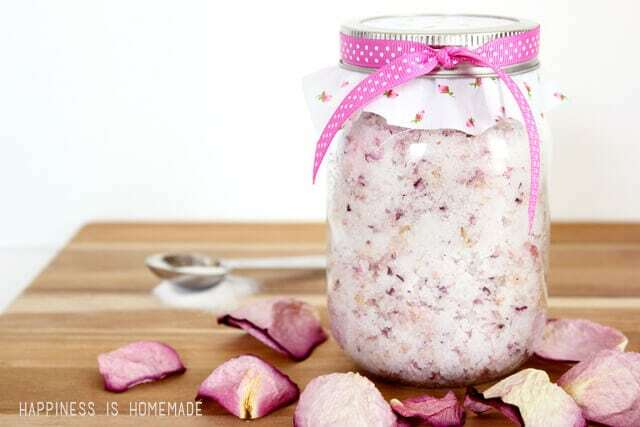 Lately I’ve been partial to this spa inspired rose petal sugar scrub that made a great re-use of one of my birthday gifts. 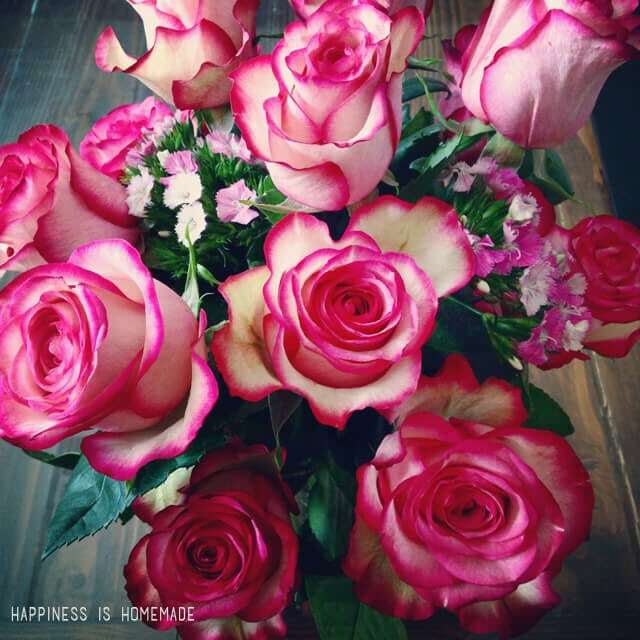 It all started a few weeks ago when The Bouqs sent me this gorgeous bouquet of flowers for my birthday. All of the flowers from The Bouqs are shipped directly from their eco-friendly sustanable farm, and this bouquet was packaged with water gel on the flower stems, so upon arrival they were as fresh as can be. This arrangement is the Desperado (original sized), and it was simply incredible. 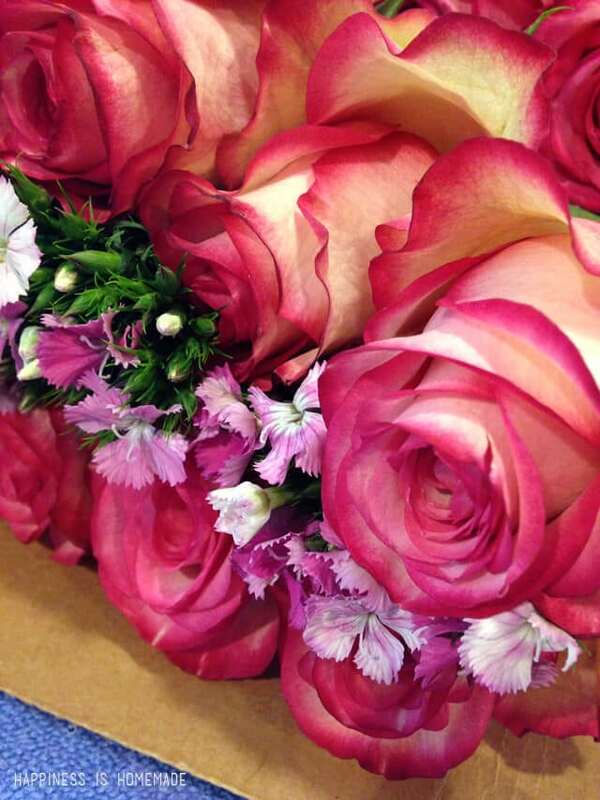 The roses were a creamy white with stunning bright magenta tips, accented by wispy purple dianthus. I have to say that this was one of my most favorite flower arrangements I’ve ever received, so I was really excited that my flowers lasted for a full week before finally starting to wilt. 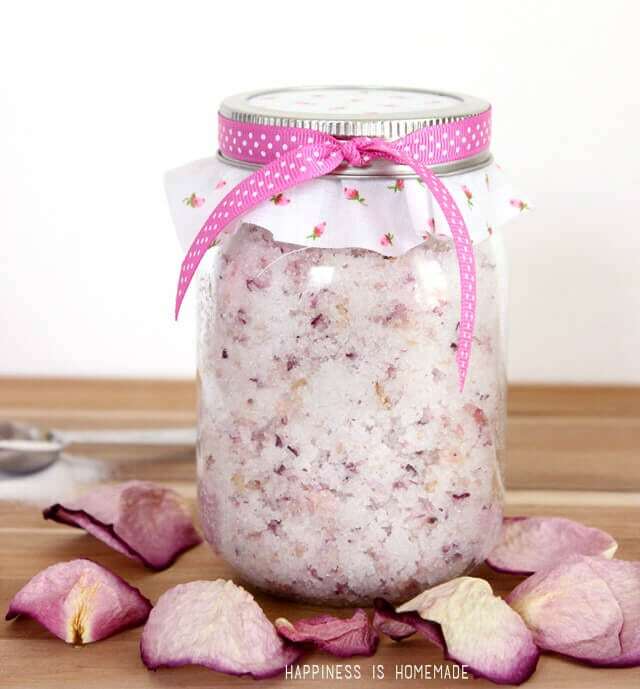 I was headed out to the compost bin with my 10-day old droopy flowers when it occurred to me that I could dry the pretty petals and incorporate them into a sugar scrub. I removed the heads of the roses and spread the petals out on a wire rack for a couple of days until they dried out. As the petals dried they took on a purple-pink gradient hue that I can’t get enough of. 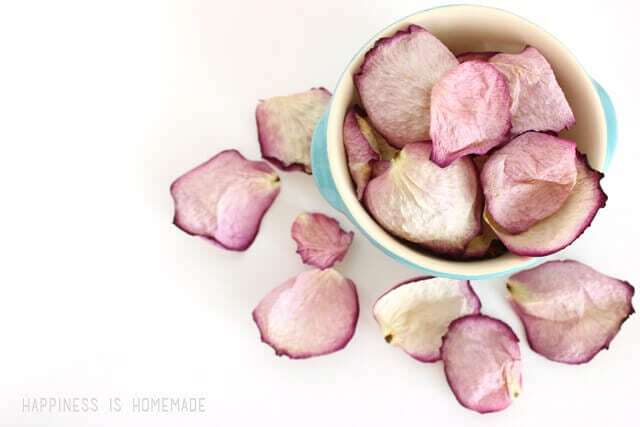 To make the sugar scrub, start with 1 cup of dried rose petals. 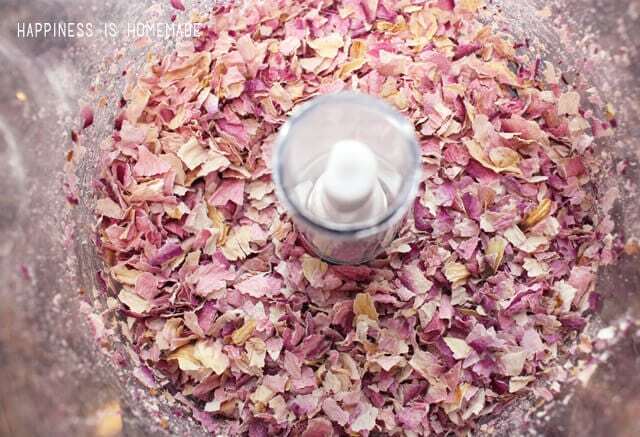 Pulse the petals in a food processor until they become teeny tiny flakes. 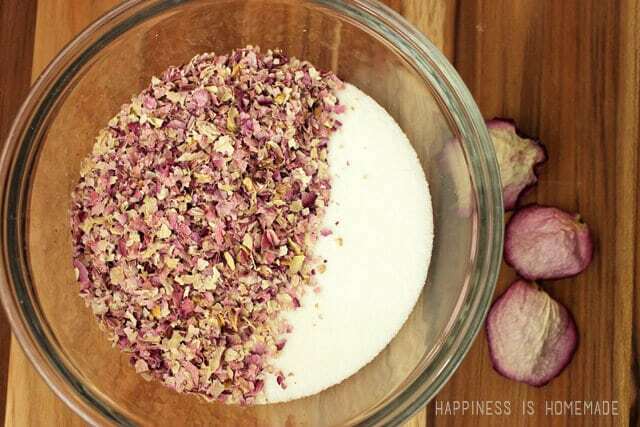 Combine the crushed petals with 2 cups of sugar, 2/3 cup coconut oil and 6-8 drops of your favorite essential oil for fragrance (optional) – lavender, lemon and vanilla all blend nicely with the light rose scent. 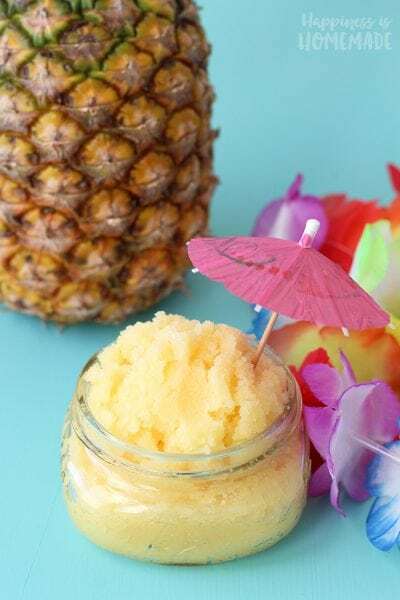 This time around, I added a few drops of my favorite Serenity blend to my sugar scrub mixture. Mix well and then spoon into a storage container. 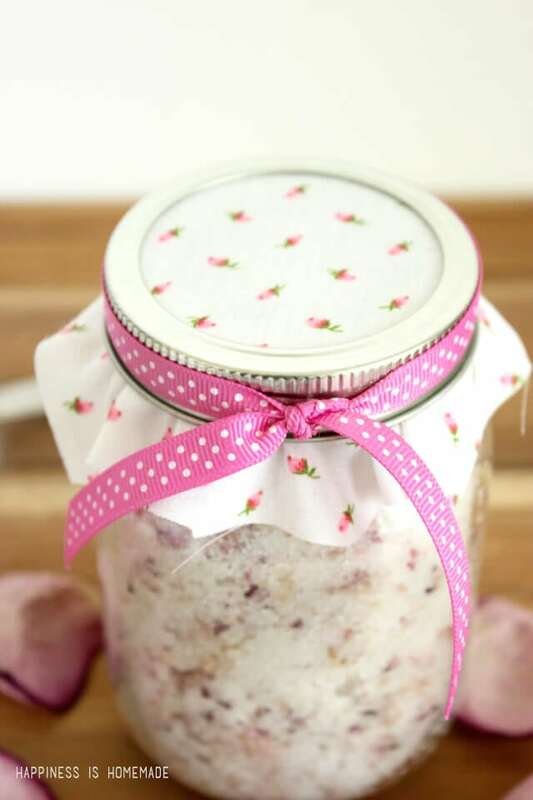 This recipe makes about 16-18 ounces of sugar scrub, so it fits nicely into a pint sized mason jar. Just add a cute fabric jar topper and a ribbon, and it would make a wonderful gift idea! 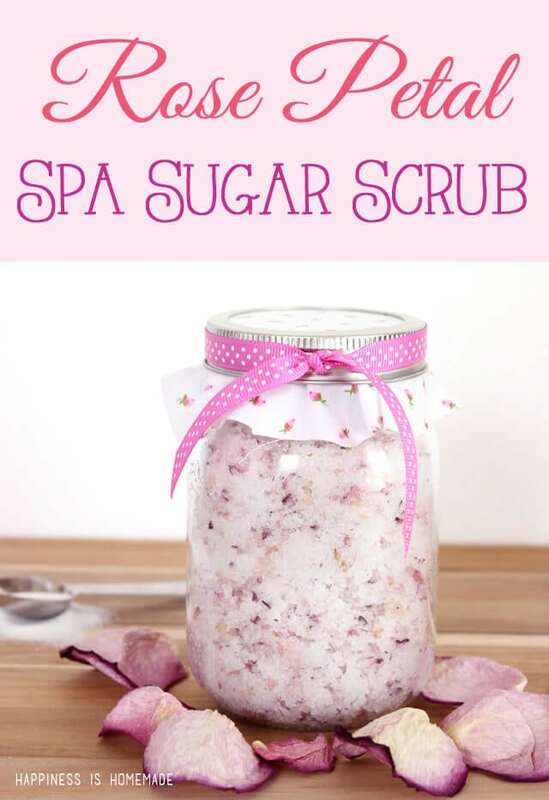 This scrub turns every bath or shower into a luxurious spa experience, and it leaves your skin silky smooth! A BIG thank you to The Bouqs for sending me the incredible birthday bouquet that inspired this entire project! 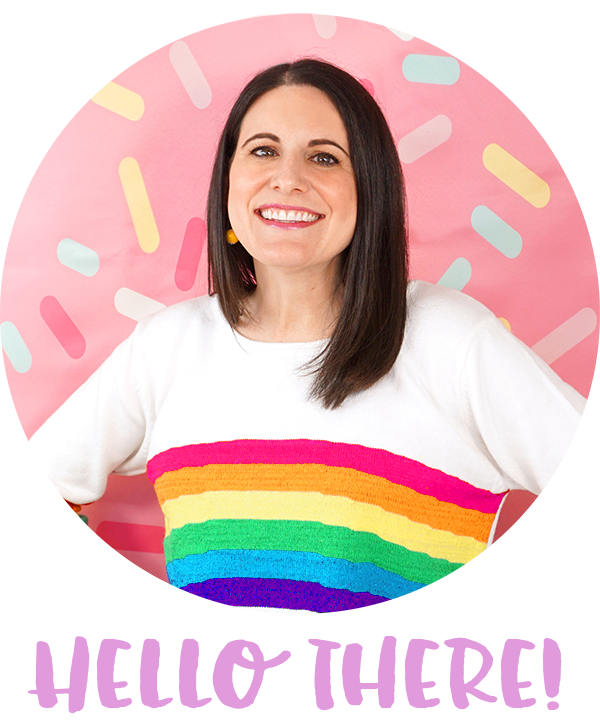 I highly recommend giving The Bouqs a look the next time you’re looking to send fresh flowers – with low prices that include shipping, you really can’t beat the quality and value! 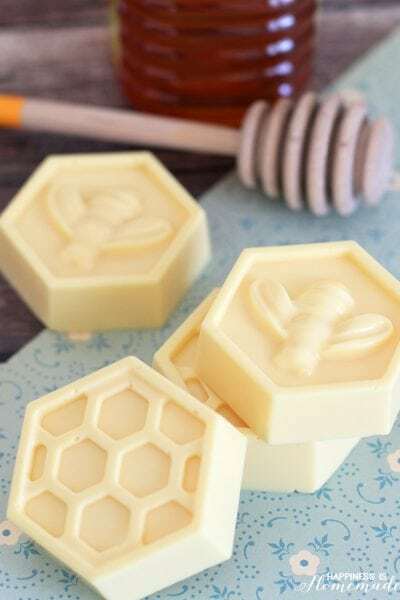 How do you apply in shower or tub just grab a handfuls and rub on ? 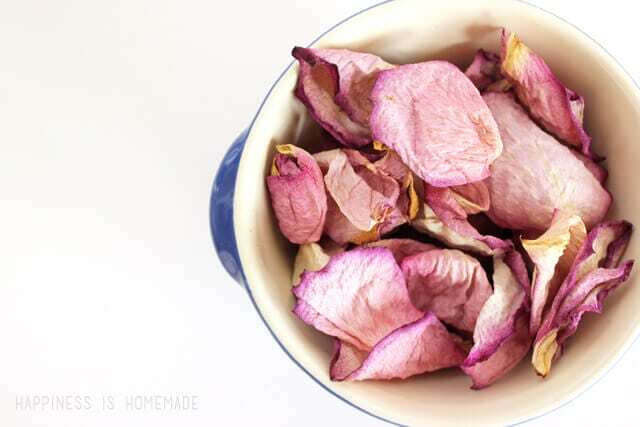 Can we use fresh rose instead of dried? I have never actually tried using fresh roses, but I’m sure it would also work (though it may have a shorter shelf life). If you try it, please let me know how it works out! I just love your idea and thank you so much for sharing this. I just have to make this scrub! I would love it if you would post more scrub recipes. 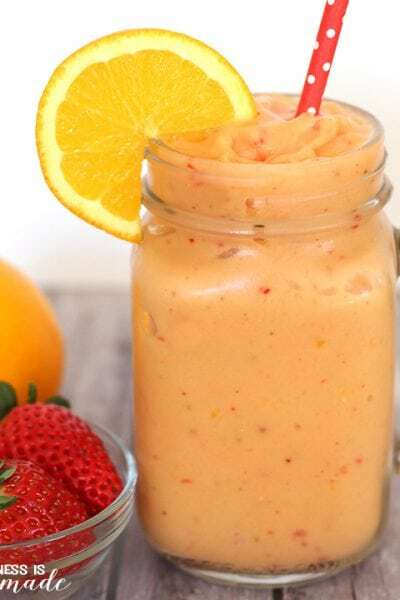 This recipe is so cool!!! I will try it today! I am just using petals from our rose bush, so they aren’t as big and pretty as yours, but I think they should work just fine:) Thank you so so sooo much for this recipe Heidi! 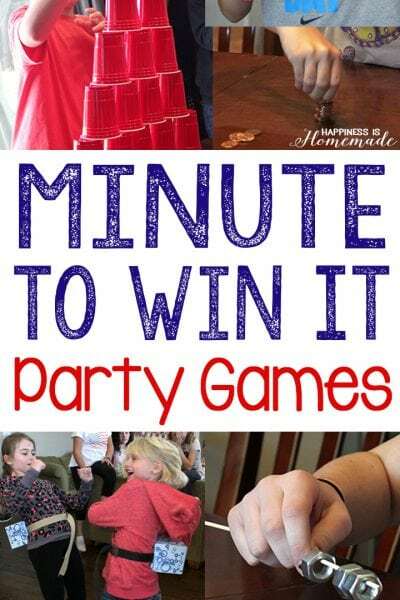 Would love to make as a favor for a bridal shower. How long does the scrub last? I just made this scrub exactly (but aside from the list, which I followed, I added amaranth oil, a single spray of perfume, a pinch of body glitter, lavender and peppermint oil drops and I put it in a regular container for an hour before I found a mason jar. But for some reason, only an hour after making it, whilst I was switching it over to the mason jar, some of the petals were already a brown yucky color..
Did I do something wrong? Did I add too much coconut oil? This is Katarina again. Also, a side note. Some of the rose was actually still new and not dried out because I was peeling it. The outside was dried and perfect but the inside was still new. Is this was happened? Were the brown pieces the newer ones? Should I only use old roses? 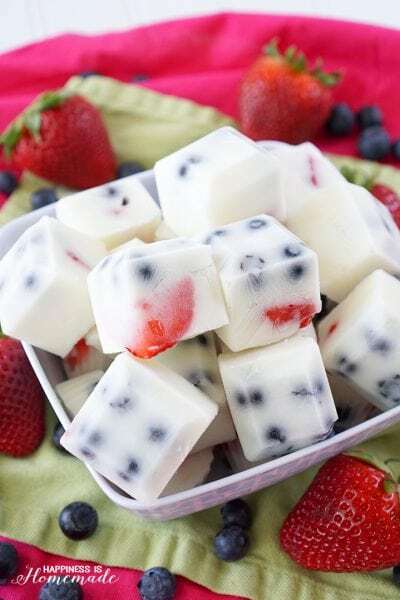 hi how much sugar scrub does this recipe make ? ?